It is important for the obstetrician-gynecologist to be able to decipher the diagnostic clues of an adnexal mass and manage it appropriately. This becomes even more of a challenge when faced with adnexal masses in the pediatric population. Adnexal masses can be of gynecological (cervical, vaginal, primary peritoneal, uterine/endometrial, ovarian) or of non-gynecological origin. 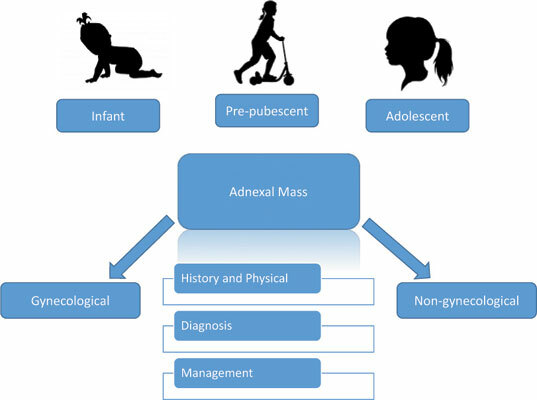 In order to approach adnexal masses in any age group, a thorough history and physical examination, along with proper laboratory studies and radiological studies need to be obtained. This pertains as much for adults as it does for assessing adnexal masses in children. This article will review the evaluation to include the initial assessment, usefulness of imaging and markers in the diagnosis, and management of adnexal masses in neonates, young children, and adolescents, and the newest recommendations for each, respectively. Pediatrics, adnexa, mass, oncology, gynecology, review.